Mark Reckless, UKIP’s Director of Policy, joins Julia George on BBC’s Sunday Politics South East to discuss the forthcoming EU Referendum and why Britain is better off trading with Europe, but governing ourselves. Britain has burned countless billions propping up the catastrophic EU project. Now Brussels is ruthlessly billing us for more – £1.7 billion more – to bail out the countries responsible for the Euro catastrophe, while France and Germany get a rebate of £801m and £614m. I originally rebelled against the government in order to help in securing the first ever EU budget cut, it’s outrageous that they now want us to pay them even more. 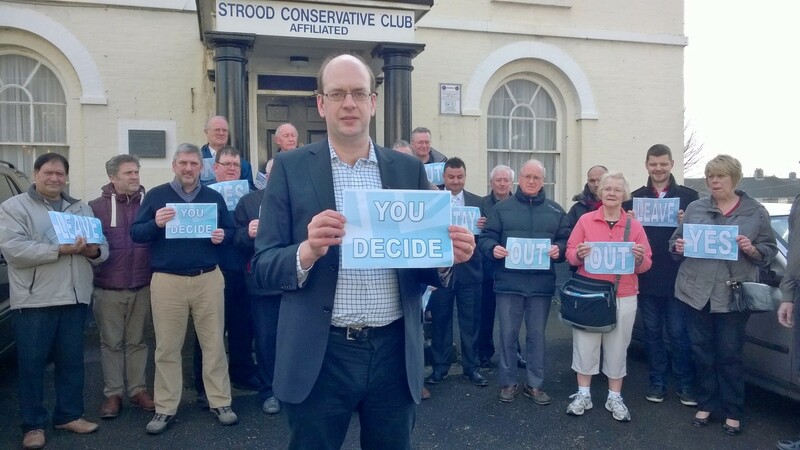 We need as many volunteers as possible to help me with my campaign in Rochester and Strood, are you able to volunteer? If not please consider chipping in £20 to help us in our fight against the EU. Despite the scale of Tory electoral losses, a strange sense of relief now pervades my party. Ed Miliband’s unexpected humiliation at the hands of Nigel Farage’s Ukip has seemingly let us off the hook. It’s as though we’ve got away with it; that far from blocking our path to re-election, Ukip is actually barring Labour’s road to power. Thinking that is a monumental mistake. Whatever problems he now poses for Labour, Mr Farage’s party still represents the most serious threat to a Tory victory at the Election. Even if its support dwindles, Ukip could still deprive us of our hopes of a Commons majority. That’s why dealing with Ukip and its supporters drawn in many cases from our own ranks, must now be our top priority. That does not have to mean a formal electoral pact. What we must do is prove that only a Conservative government will deliver the in/out EU referendum they desire, and that we can be trusted. We must reaffirm that only David Cameron will deliver such a referendum. With Mr Miliband opposed to letting the British people decide themselves, we must challenge Mr Farage to declare his hand: is he ready to thwart Tory candidates who will deliver a referendum, and instead allow a Brussels-loving Labour Party to rule? If so, he should be honest with his supporters now and admit he is happy to help Mr Miliband through the door of No10, with all the dangers that poses to our economy. But in turn, Mr Cameron has to demonstrate we are being honest and straight-forward with the voters. UKIP’s greatest fear is that they will be tricked, that the referendum will be an establishment ruse, with Mr Cameron pretending to repatriate powers only for voters later to discover that little has changed. UKIP is also deeply suspicious of the fairness of a referendum where the full weight of government is likely to be thrown behind one campaign – the campaign to stay in. So I am calling on the Prime Minister to end those worries, to change the likely referendum arrangements and make the contest a level playing field. Voters must be offered a free choice – with the Government not formally recommending a yes or no but leaving it to individual ministers, Mr Cameron included – to state their individual views. What Mr Farage – and those who think like him – want is a straight in/out referendum on EU membership, not a referendum following a sleight of hand renegotiation. A straight choice, an honest vote –that would amount to a fair deal for Ukip in return for their support when at the General Election. In Mr Farage’s words this weekend, the Ukip fox is well and truly loose in the political hen house. If Mr Cameron is to be re-elected as PM he needs to shoot that fox before it does irreparable harm. Close to 4,000 people took the opportunity to vote in Britain’s first constituency referendum on Britain’s membership of the EU. The result was resounding, with 80.27% voting NO to the question “Should the United Kingdom be a member of the European Union?”. As someone who has campaigned their whole adult life for Britain to be an independent country, governing ourselves, controlling our own borders, and trading freely with the whole world, I am delighted with this result. It has been nearly 40 years since the British people had a say on Europe. In that time so much has changed and people feel the EU is heading in a direction they never signed up for. 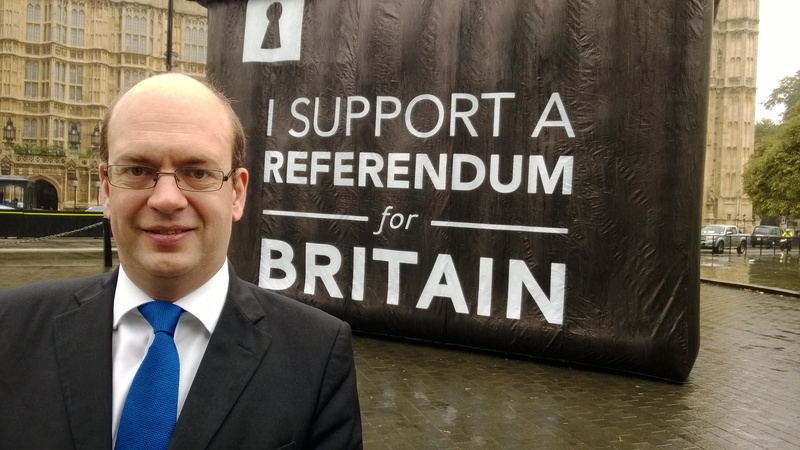 In coming months my pilot referendum in Rochester and Strood will be replicated and taken forward by other Conservative MPs around the country. I expect that those will also show support for the UK’s withdrawal from the European Union, even if not always by quite such an overwhelmingly sound margin as in the Rochester and Strood constituency. With the Labour party against offering a referendum, and UKIP unable to deliver one, only a Conservative government can and will give us the chance to vote for an independent Britain in a nationwide referendum.